I was eleven or twelve years old (1977 or 78) when this photo with my sister was taken. My father worked for Northeast Alabama Junior College (as it was named then) as a media technician and decided to take my sister, mother, and I with him on his business trip in Nashville. 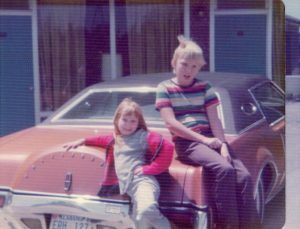 The Lincoln Continental that we’re posing with was my mother’s favorite car. While our father was at his meeting, we stayed at the hotel with our mother. We walked to local souvenir shops and other than that, we did little else. As you can see, clothing has somewhat upgraded itself since then. A good thing, actually. But we had fun. One thing about taking a road trip with our father was that you stopped ONLY to get gas and at an occasional restaurant. I remember many trips from Fort Payne, AL, to Middletown, OH, when we were younger. Most of the time, our father took the back roads rather than I-75, which took much longer to drive, but the scenic view was worth passing the time. Watching the landscape pass by fed my imagination, and I often had books or comics to read, too. But we never stopped at any of the interesting places. We observed from afar. My mother told me years ago that when I was three or four years old, she and he had driven all the way to Washington state and back to Alabama, but he only wanted to drive. Never stop. She said that they passed a road sign, “The Grand Canyon Scenic Overlook, 1 Mile” but he didn’t stop. He kept driving. Some years back, I loved driving, but I also loved stopping to see places I’d never visited before. My wife and I have stopped in some states simply to hike and enjoy nature in state parks because we most likely would never travel along those roads again. Seeing is one thing, but experiencing the place is far greater, and I think that’s something our father never really took into consideration. Meeting new people and learning the history of these small towns are what excites me about traveling. Without stopping, you cannot discover the underlying beauty, and that’s where the greatest treasures are found.